Was it different for Mary on that night in Bethlehem? Although her calling was unlike any other, as a first-time mother she must have felt the emotions that come with having a child. I imagine she too looked to heaven for answers and assurances and like every mother cried tears of fear, tears of joy and tears of love. This original work was commissioned by Ocean Blue Entertainment and 1492 Pictures to assist in promoting the motion picture “The Young Messiah” was released in 2016. The Greenwich Workshop is proud to be a partner in offering to our Authorized Dealers an opportunity to share with their collectors this exciting new Fine Art Limited Edition canvas release by Liz Lemon Swindle. Please place your order today and ask about how you can receive an official movie poster with each purchase. Liz Lemon Swindle has a deep, abiding faith that she feels blessed to share through her art. A lifelong Utah resident, she studied fine arts at Utah State University. She worked for several years as a set designer and painter for the Osmond Studios television production company. As her family grew (she and her husband Jon Swindle today have five children), she saw the need for a more flexible career and decided to focus on oil painting. In the early 1980s she tutored under renowned wildlife artist Nancy Glazier and soon after established her own impressive reputation as a wildlife painter, participating in shows at major galleries in the central and western United States. However, Lemon Swindle became increasingly discontent, feeling artistically and spiritually unfulfilled. In October 1988 she reached a turning point when she submitted a portrait of children to the National Arts for the Parks competition and received the coveted Founders' Favorite award. She realized then that there was an audience for her portrait painting and by the early 1990s she had devoted herself to the topic closest to her heart: her faith. 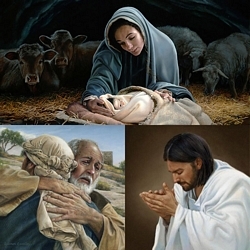 A one-woman show of her Christian art traveled to cities nationwide in the summer of 1997 and a book of her paintings, "She Shall Bring Forth a Son" was published in 1998.